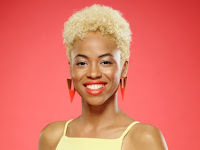 Delaware Arts Info: Nadjah Nicole Brings Down the House at "The Voice'"
Nadjah Nicole Brings Down the House at "The Voice'"
Huge congratulations to another Delawarean making her voice heard in the entertainment industry! Singer Nadjah Nicole (aka Nadjah Nicole Pennington) wowed the celebrity judges of NBC's "The Voice" during her appearance last week, where she sang Janelle Monáe's song,Tightrope. The 23-year-old Claymont resident has regularly performed around the First State, in Gable Music Venture events like Ladybug Music Festival and World Cafe Live at the Queen singer-songwriter showcases. She returns home this weekend to celebrate her slam-dunk performance. Nicole is headlining at the World Cafe Live at the Queen's downstairs stage on Friday, October 2 in a show by Gable Music Ventures. She'll be backed by her four-piece band and a pair of back-up singers. Tickets for that show are available HERE. Check out a recent interview with Nadjah Nicole by Dominick 'King Dom' Draper in 55 Hours last weekend. Read Ryan Cormier's News Journal coverage of her appearance on "The Voice" here. See her knock-out performance on "The Voice" HERE! Congratulations on making it to the "Voice", being from Delaware myself I found to be exciting to see a local on the show I hope you are able to return next season with a perfected sound. and WIN the Voice ! to me you are a winner just by making it to the show.